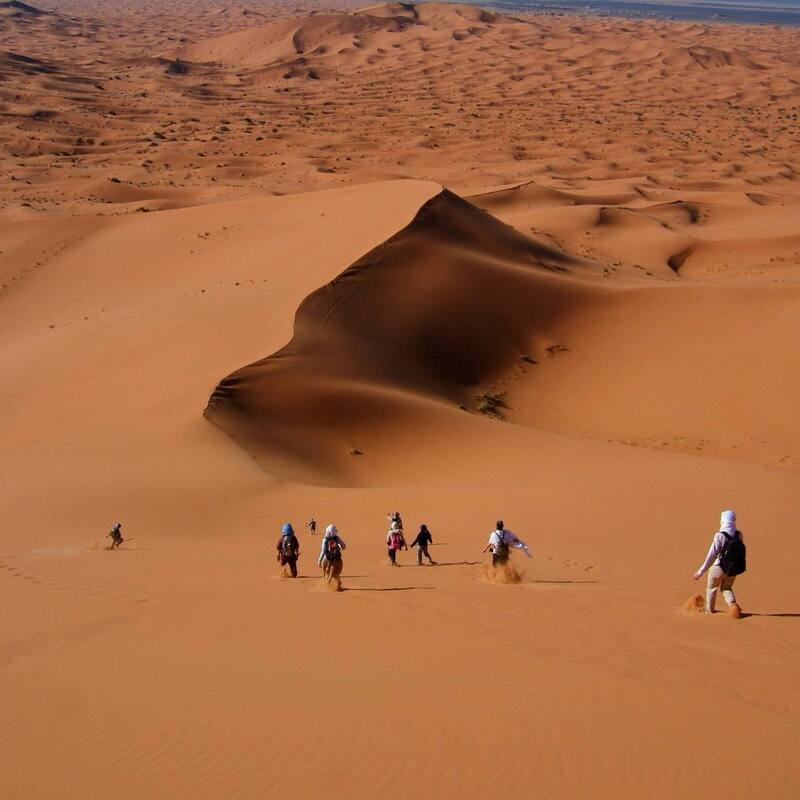 On this trip you’ll discover the heights and valleys of the High Atlas before exploring the south of Morocco on your way to the endless dunes of Erg Chebbi—one of Morocco’s two Saharan seas of wind-blown sand dunes and back. On 2 amazing days you’ll walk through the Palm Valleys of the ziz valley, stay in the beautiful Dades Valley, pass through the spectacular Todra Gorge—a narrow, 300m high canyon—ride a camel into the Sahara at sunset, discover the rocky landscapes and hidden oases of the Dades Valley, and visit the once prominent trading post of Ait Ben Haddou—famous for its 17th century fortified kasbahs. Along the way you’ll pass through Berber villages where locals are always friendly, cross some spectacular mountain passes of Tichka, soak up the sweet, pungent scent of the High Atlas junipers, travel through the gorgeous green valleys of rural Morocco that lead you to its vast desert plains, witness a caravan of camels silently passing you by, sleep under the stars of the brilliantly clear night sky and wake to a spectacular desert sunrise like no other. This journey through the High Atlas and Sahara has all the ingredients for an unforgettable nature adventure! From the great canyons of Todgha we go along the road of 1000 kasbahs, since there are enormous Kasbahs on both sides of the road. Some of those old fortified houses are restored but unfortunately a lot of them are ruins. We drive up to visit the Dades gorge & valley, and we head to the Berber family for Lunch, Along this valley another valley called valley of roses appearing with the green colors of its Alfalfa plants, olive trees, fig trees and grapes. This valley gives birth to a rose from which locals produces different cosmetic products like soap, perfumes and skin creams. Locals here celebrate this rose by organizing a national festival eachend of April. Getting to Ouarzazate (Hollywood of Africa, Noiselessly town, The door of the desert), is a city situated in the middle of a bare plateau, south of the High Atlas Mountains. It is mainly inhabited by Berbers, who constructed many of the prominent kasbahs and building for which the area is known. One of those building is Taourirt Kasbah diverted in 17th century.